The Dalhousie Libraries are wishing Mike Groenendyk the very best in his new position as the Business Librarian at Concordia University (starting August 19). Mike graduated from Dalhousie’s School of Information Management program this spring. While still in his first year of the program, he and classmate Riel Gallant approached the Dalhousie Libraries with a radical idea to get a 3D printer in the Killam Library. Both University Librarian Donna Bourne-Tyson and head of Library Information Technical Services Marc Comeau agreed to give it a try. The project has been so successful that it’s been expanded to include the Sexton Library, with more 3D printers to come at other Dal Libraries in the future. Mike and Riel’s goal was to democratize 3D printing, meaning that it had to be inexpensive and in a public space, and they achieved this goal in a very short time. In addition to bringing accessible 3D printing to Dalhousie, Mike also worked at the Help Desk in the South Learning Commons in the Killam Library. There he provided assistance to staff, students and faculty regarding the use of Dalhousie-supported software, personal computers, email, and wireless Internet. He also provided assistance with other IT-based services such as web hosting, worked on the transition to Dalhousie’s new Office 365 email and collaboration tools, helped print incoming 3D model submissions, and helped to prepare the new 3D printers that recently came in. Mike, we will miss you. Concordia is lucky to get you! 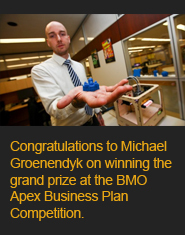 Michael Groenendyk, the School of Information Management student who helped bring 3D printing to the Dalhousie Libraries, recently won the grand $5,000 prize at a national business competition. Michael’s proposal was for a 3D design service called Final Frontiers 3-D Design, creating designs for science fiction and fantasy products such as custom-made rings and detailed home decorations. Michael credits having worked at the Killam Library’s Help Desk with giving him an edge to win the competition. Over the past year, he has spent many hours at the Help Desk, assisting people using the 3D printer, giving him both a solid knowledge of the technology and seeing the ways in which people use the 3D printer. Congratulations on this fantastic accomplishment Michael! Read more about Michael’s win in Dal News. Michael Groenendyk, Help Desk employee at the Killam Library, was recently awarded a CARL Research in Librarianship Grant. Michael is also a student at the School of Information Management. The Canadian Association of Research Libraries (CARL) Librarianship Grant supports projects involving structured, evidence-based research in libraries that propose answers to real-world issues. Established and newly appointed librarians working in a CARL member library and current Library and Information Studies students are eligible to apply for this grant. Michael’s grant-winning project is called 3D Printing and Scanning at the Dalhousie Libraries: A Case Study. He was awarded $2,000 to continue his research in the use of 3D printers and scanners in an educational environment and to develop an open access, online repository of 3D digital objects. “I would like to thank the Canadian Association of Research Libraries for providing me with this opportunity to further develop my research into 3D printing and scanning technologies at the Dalhousie Libraries, and to complete the groundwork on the 3D model repository created this summer on DalSpace. This additional funding will be very helpful in moving this project forward and, as such, is much appreciated,” said Michael. 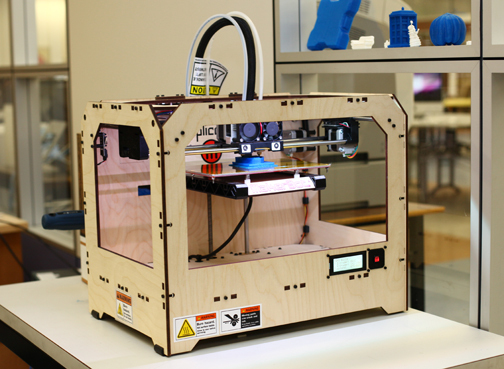 The 3D printer is located at the Help Desk in the South Learning Commons in the Killam Library. 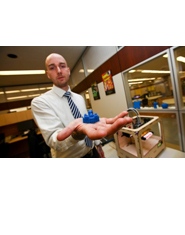 Files for printing can be emailed to 3dprint@dal.ca Printing costs $1 per hour. The printer uses PLA plastic filament that is biodegradable. 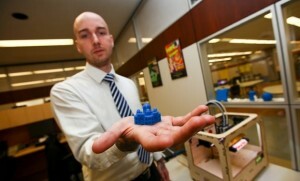 More about 3D printing at the Dalhousie Libraries. Congratulations from your colleagues at the Dalhousie Libraries Michael! The 3D printer in action at the Help Desk in the Killam Library. Some objects printed on the 3D printer. 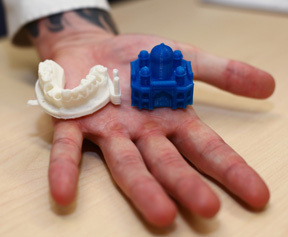 Last October, the Director of the Dalhousie Libraries’ IT department, Marc Comeau, and two School of Information Management students, Riel Gallant and Michael Groenendyk, gave a presentation at the Access 2012 conference about 3D printing and scanning. Riel and Mike, while still new library school students, came up with a proposal to bring 3D printing, 3D scanning and a 3D collection to the Dalhousie Libraries . Their idea came to fruition in the spring of 2012. 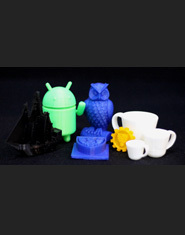 This presentation offers a detailed look at 3D printing at the Dalhousie Libraries so far.